International stars will play shoulder to shoulder with local heroes at Melbourne Convention Centre this May on the 12th to 14th. Battle Arena Melbourne (BAM), Australia’s largest fighting game major, and one of the biggest live esports in ANZ, returns for its 9th annual event on May 12-14. Now taking on two bays in the Melbourne Convention Centre to offer both a community experience and a major esports festival – this year is BIG BAM! With Australia and the world’s best players playing across 8 national championship titles including Street Fighter V, Tekken 7, Super Smash Bros, and multiple side events, BAM is aiming for a third consecutive year of record breaking attendance. The event will host over 1,000 competitors, plus spectators taking in the excitement live, and hundreds of thousands more viewing from home on Twitch.tv. 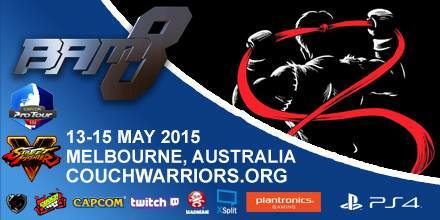 We are pleased to announce the return of special guest Jeffrey “Chamba” Cruz to Battle Arena Melbourne in 2017! The artist for Udon Comics’ Street Fighter 2 Turbo, Super Street Fighter & Street Fighter V : Life and Death(s) of Charlie Nash, he will be appearing both Saturday 13th 11am-5pm, and Sunday 14th May, 11am-3pm. Chamba, who was a popular guest at BAM 2014 and 2016, will be available to draw commissions of your favourite characters, sign prints and hang with fellow gaming fans!